rocky's bru: Will the REAL Anak Bangsa Malaysia stand up, please?! Will the REAL Anak Bangsa Malaysia stand up, please?! What kind of Rakyat have we become? How come we have allowed our destiny and our childrens’ future be charted by a bunch of bungling fools, perverts, tricksters and outright crooks? 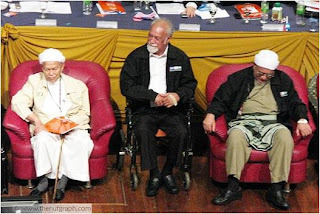 How did we as a nation ended up with a syiok sendiri jargon-laden PM and a sleazy opposition leader who wants to be the PM at all costs plus sleepy mullahs and assorted rabid racists hellbent on imposing social chaos and anarchy on a land they know they cannot own. And so he's calling for the people to take matters in their hands. In a peaceful manner, of course. Folks, we need a revolution. No, not of the French or Russian or Romanian kinds, but a revolution within our inner selves, and collectively as a society, as members of the real Anak Bangsa Malaysia .... Should we just stand aside and watch our curiously spineless government bent over backwards to accommodate these subversives in its futile hope of garnering votes in the next GE? Is this what its all about? Votes? Do Malaysia have the luxury of trading anarchy for votes? No, we don't have that luxury. Let DN know how we can go about and make our force our politicians to serve us and not themselves, H E R E.